Product Description A sophisticated blend of power and versatility to help you process your samples safely and efficiently. Intuitive control panel can save protocols in five memory locations on the panel for instant recall with a single keystroke. Each protocol for centrifugation time, speed, 'g' force, temperature, acceleration and braking rates can be selected. Set parameters and actual run conditions can be displayed and modified in real time. Reliable and repeatable runs and precise temperature control offering settings from -9C to -40C. Max speed of 8,000 rpm, Max RCF of 10375 xg. Max capacity: Swing out (4x750 mL) 3000 mL, Fixed Angle (8 x 100 mL) 800 mL. 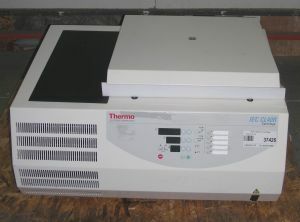 This centrifuge includes a swing-out rotor with 2 microplate carriers and 2 buckets (as shown in photo).